Hybrid hydraulic units lineup | Oil Hydraulics | Daikin Industries, Ltd. Specifications vary depending on the machine type. 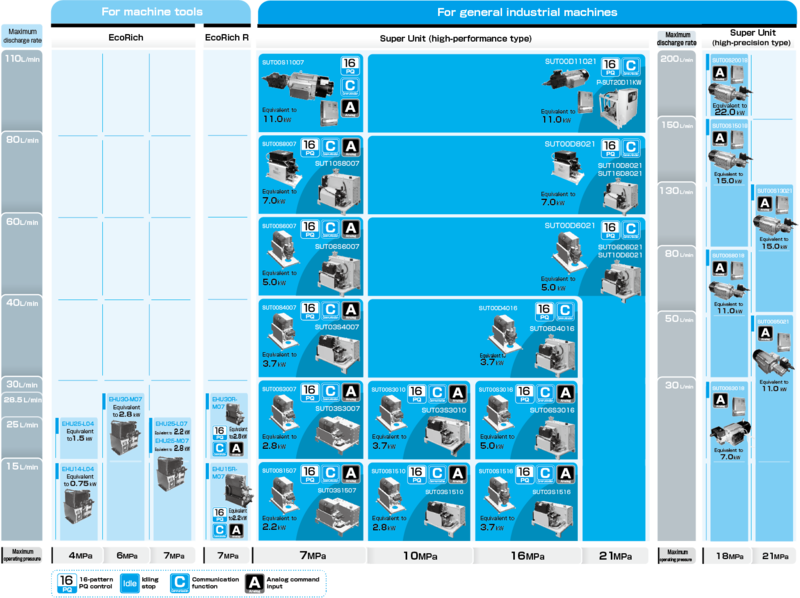 The Daikin product lineup provides various functions and capacities according to the machine type. The above motor capacities are given for guidance only and do not represent the standard capacities of general motors. When selecting a SUPER UNIT, verify the specifications of each model by referring to “Pressure – Flow rate Characteristics (Typical)” on Pages 13 and 14 and “How to Select a SUPER UNIT” on Page 49. For the purpose of making improvements, the specifications given in this catalog are subject to change without prior notice. Be sure to see the latest model chart.